Which is healthier: tastes-like-yogurt froyo or tastes-like-ice-cream yogurt? 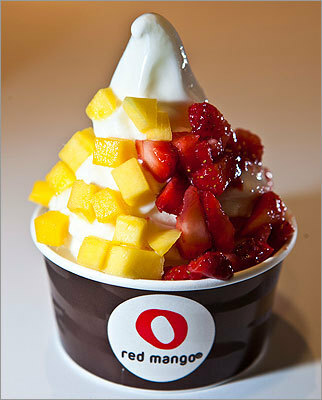 An LA startup-turned-national chain, Red Mango plays foil to the minimalism of Pinkberry, adapting its froyo for use in more elaborate products such as fruit- and tea-infused yogurt smoothies, and Ghirardelli-laced hot chocolate chillers. The froyo lineup features a tart original, bold pomegranate, rich Madagascar vanilla, and the current featured flavor, raspberry cheesecake. $3.75 for a medium original, $4.25 for flavored; 334 Massachusetts Ave., Boston, 857-366-4116; 15 Shipyard Drive, Hingham, 781-741-8900 (self-serve only); 1245 Worcester St., Suite 2042, Natick, 508-653-2509, www.redmangousa.com.